November seems to be film festival month in Sydney with top movies from Japan, China, Israel and Europe. 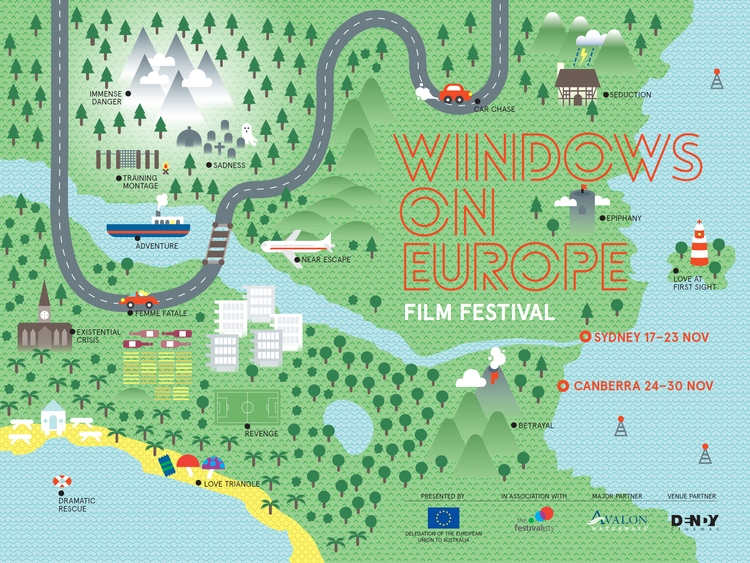 The 9th annual Windows on Europe Film Festival will take place at Dendy Opera Quays from 17 to 23 November before heading off to Canberra. Presented by the Delegation of the European Union to Australia and New Zealand (EUDEL) and run by The Festivalists, this year's line up includes the best new films from the 28 member states of the European Union. Here are some of the highlights to keep you glued to the cinema seat. The Irish pub may be a common sight in many international cities but few may be aware of its importance in Irish society. Through his documentary, Director Alex Fegan offers viewers a window into the warm, witty, musical and vanishing world of this traditional institution, handed down through generations. Enjoy the heart and soul of Irish culture with a FREE pint of Guinness on arrival. From Spain comes an intimate and heartbreaking love story that resonances with our times. Directed by Carlos Marques-Marcet, '10,000 KM' revolves around a married couple who are forced by work to live apart for one year and their attempts at keeping their relationship alive through the internet. From Czech Republic comes a drama about life behind the Iron Curtain. Directed by Andrea Sedlackova, 'Fair Play' revolves around young sprinter Anna who is fed anabolic steroids as part of a State-sponsored medical programme in preparation for the 1984 Olympics. Anna's attempt to fight for her rights is exemplary of ordinary folk who take a stand against totalitarianism in Czechoslovakia. From France comes this bittersweet and occasionally hilarious tale of friendship and mental breakdown which toured the film festivals in New Zealand, Berlin and Istanbul. The story revolves around the awkward friendship between a former musician turned caretaker of an old Paris apartment building and its resident. Director Bas Devos' visually impressive movie arrives from Belgium. 'Violet' revolves around 15-year-old Jesse and his emotional struggles with guilt and to explain his witness of the senseless stabbing of his friend Jonas in suburbia. This film with stunning narrative and imagery debuts in Australia. From Austria comes this documentary about the global energy crisis, the pioneers who help shape solutions and the rebels who clash with the corporations and profit motives which stand in the way of a solution. Enjoy this cinematic world tour which addresses climate change, clean energy, wars over oil and gas and nuclear meltdowns. Check out the website for the full movie schedule and tickets at Dendy Opera Quays. Why? Where else can you watch the best of European Union films?